Keef just can't make up his mind! When I posted about how I made my fabric markings and queried whether I was using the best or most efficient methods of transferring pattern markings, I was completely unprepared for the wealth of knowledge and expertise that came my way. Y’all are machines of efficiency! The general reaction in the comments was, to paraphrase, “*!%$ that *!$£& Joanne, get with the programme and put a pin in it”. Well, not just that. You guys also shared some fantastic tips on what tools work best for you, how you mark and sew darts, how you notch (or don’t notch). I learned more in a single post than I think I would in a dressmaking course and I hope some of you also learned some great new time-saving techniques. I’ve done a bit of a round up of all the comments here, feel free to add even more! Having dissed my tracing wheel and carbon paper as fully unsatisfactory, I found a few of you do actually use this method, and it works for you. Shivani uses hers to mark up muslins; RedSilvia uses hers on everything except sheer fabric; Clare recommends using one with a cutting mat so the colour takes better and TJ says you’re better off with a bumpy (rather than a spoked) wheel to stop any bunching. TJ also gave a top tip on choosing carbon paper: wax-based for soft or coloured fabric and carbon-based for firmer or lighter fabrics. Tailor’s chalk was one of the more popular marking tools, but it came in a myriad of forms. Standard chalk ‘triangles’ are deemed too inaccurate for some marking (although VeraVenus keeps hers sharp with a craft knife); chalk wheels are by and large approved although some have found it ‘drags’ delicate materials, The winner by far is the chalk pencil – easy to sharpen and maintain accuracy. Shivani and Mikhaela recommended getting a refillable one that comes with lots of colours for different fabrics. Here’s a link to it in case you fancy treating yourself. It’s just under £8. And for anyone who’s interested in trying something completely different, Linda recommends drying slivers of soap on radiators and shaving to a sharp edges for a washable marker! Many of you are fairly agnostic when it comes to tools – with some naughty beggars using anything that comes to hand! Over to Elisalex! 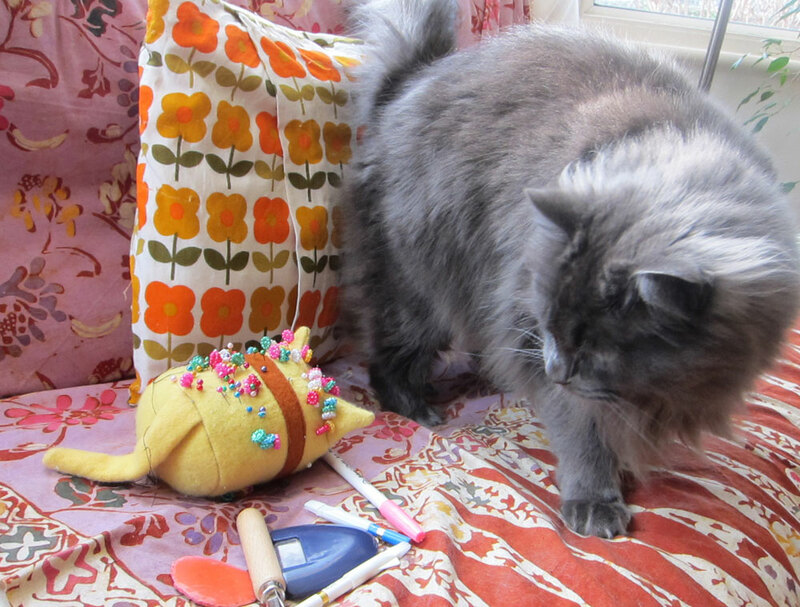 “Don’t tell anyone, but I usually just fold back the pattern paper and grab whatever I have to hand – a chalk pencil, pins, my son’s crayons, God-forbid sometimes even a Sharpie…” Sorry Elisalex – you’ve been outed! You may join my sewing slattern club if you wish. But hooray! There are still some tailors tacks aficionados out there. Sorbetsurprise, Chris and Alison all use this method, although sparingly. Methinks I can probably rest up on using them for absolutely everything. So why have I been using tacks all this time when pins do just as good a job, albeit a more temporary one. Sandy shared a great video showing how you can mark and fold darts with just a few pins. Lauren, Chris, Clare, Sandy, Symondezyn and Sorbetsurprise (and that tool-floozy Elisalex) all push pins through the pattern pieces and fabric, then separate the fabric to mark where the pin went through. Like durrr, why didn’t I think of that? So how do you guys decide what to transfer onto your fabric? Well… that depends on what’s important to you when it comes to fitting. Shivani does mark the waistline, hip and bust points on her muslins, Lauren only marks what is strictly necessary to get the job done. I guess it’s whatever works for you. I gleaned some very useful tips on sewing darts too. Sandy shared a fantastic time-saving tip: snip the dart legs in the seam allowance and mark the dart point, then simply fold the dart at the point until the legs match up. When you come to sew, do a few stitches leaving a long tail, then pull that tail towards the snips – giving you a handy guide for your dart line. Another tip from Karen was to shorten the stitch length as you reach the pointy bit of the dart to give a neater finish (and I imagine a stronger stitch too). Who knew! Thank you all so much for sharing your tips and tricks. It’s been unbelievably helpful. The most reassuring thing I discovered from all the comments was that there’s no actual right way to do it. Well, some people might insist there’s a right way but we’re not listening to them, are we? So it’s OK to take short cuts if they’re tried and trusted methods. It’s OK to just push back that pattern paper and draw a line instead of labouring over loops of thread. We are not going to sewing hell! Hooray! So I have a bit of a confession to make. I had intended to do something different with this version, maybe some piping or something round the collar. 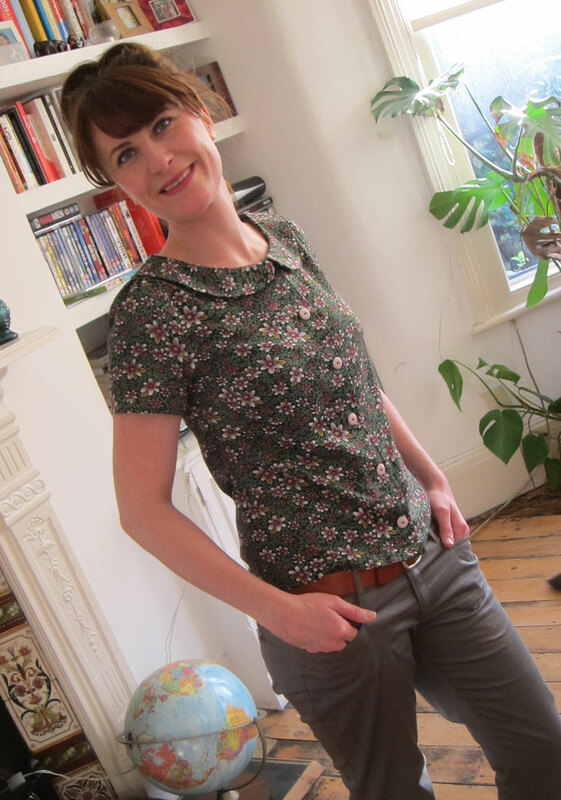 But I was so excited to be whipping up a blouse in a day I just kind got on with it instead. So it’s pretty much a carbon copy of the previous Violet – but in a different fabric. Hey – if it ain’t broke etc. Again I used fabric from Walthamstow market at £2 a metre. Bargainous. The buttons are vintage and are from a stash my mother-in-law gave me a few years back. I love their larger size – they make me feel like a kid again for some reason! In other news, I’m woefully behind on the Minoru sewalong. I’ve only just cut out the fabric. Plus, I know I won’t get any sewing time over the next couple of weeks so I’ll miss the deadline completely. Thank god for blogs where you can go back in your own time and start again! 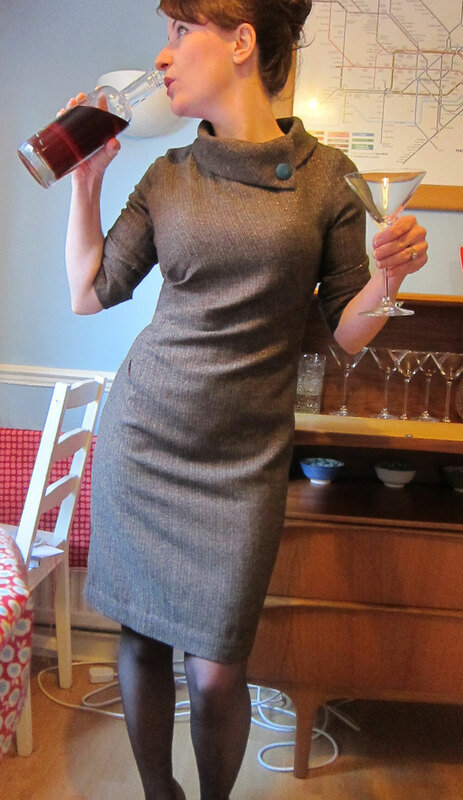 I’ve really been enjoying Sewaholic’s Renfrew pattern-testers cropping up all over the place. 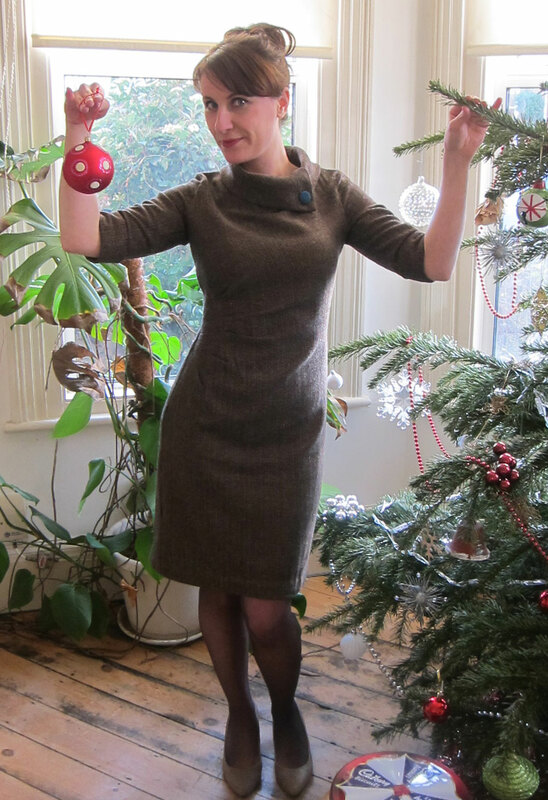 Karen and Jane‘s are particular highlights – fantastic versions and a great advertisement for the pattern. One for the list. And finally, I’ve mastered* crochet! 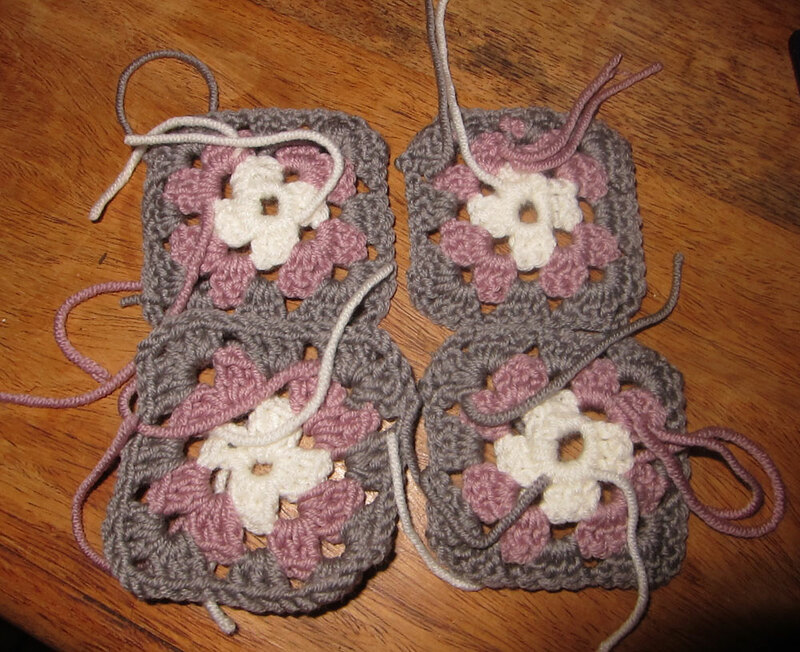 I’ve been whipping up granny squares when I get a moment for the last couple of days, ever since my friend Bridie came round for another tutoring session last week. 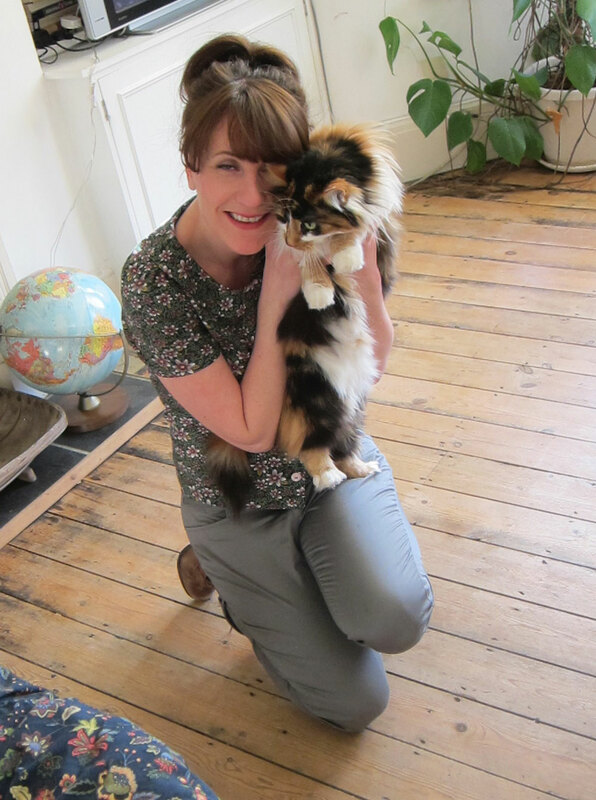 I shouted and cried all the way through (sorry Bridie) but I got there in the end. I’m not up to the crochaliser standard yet, more’s the pity. *When I say mastered I mean I can do one version of a granny square and my tension is probably all wrong but I’m happy as Larry just knowing that I’ve got the basics. What about you? Any new crafty skills you’re learning? Does it feel weird being an absolute beginner again? I’ve just been putting together my second Colette Violet. 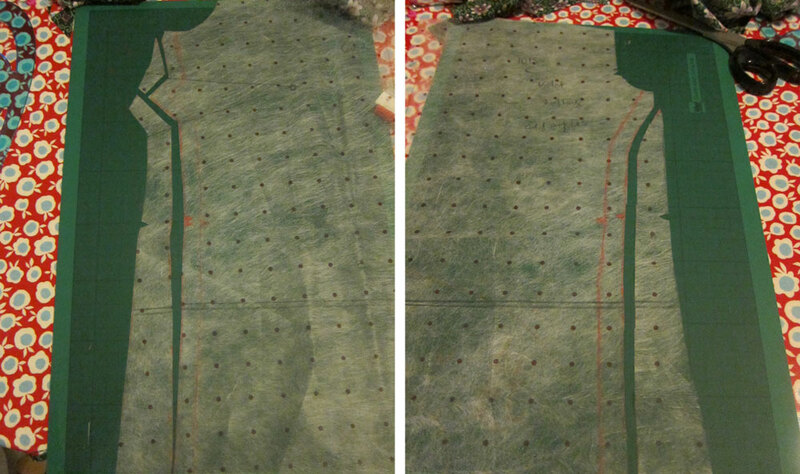 The pattern calls (as most of them do unless it’s a pattern for a sack) for a number of markings to be transferred to the fabric, including darts, notches, dots and buttonholes. It led me to ponder (as I made my own markings) whether I was really using the best and most efficient methods. Is there a better way I thought, as I threaded up yet another needle after 10 minutes of groping for it blindly on my busy floral tablecloth. Note to self: NEED wrist pincushion. I use tailor’s tacks to mark dart points first. I do this by running a threaded (doubled thread) needle through the pattern and both fabric pieces once, leaving a two inch tail, then a second time, leaving a large loop about four inches. I then snip my thread (leaving another two inch tail) then snip the loop leaving what I like to call the cat’s whiskers. I then pull (gently!) the pattern off the fabric and separate the two pieces of fabric (again – gently!) and snip the joining threads in between the two pieces of fabric. This leaves me with a set of cat’s whiskers on each fabric piece. Again I use tailor’s tacks for this, using a simple running stitch but leaving large loops on the top (this one I call the Loch Ness Monster) which I then snip. Then, as before I pull the pattern of the fabric and gently separate the two pieces until I have enough room to snip the threads in between the fabric pieces. Once I’ve done that I’m always afraid the thread will fall out so I go back with a ruler and chalk and trace along the markings, then remove the tacks. I do all of this on the wrong side of the fabric and I use a brightly coloured thread so it shows up – usually fluorescent yellow. Unless I make a Big Bird costume at any point in the future I am highly unlikely to use this shade. It probably takes about four to five minutes for each dart. Now, is there a quicker way? Could I omit one of these steps? This is a little trickier so I’d love to know how you guys do it yourselves. 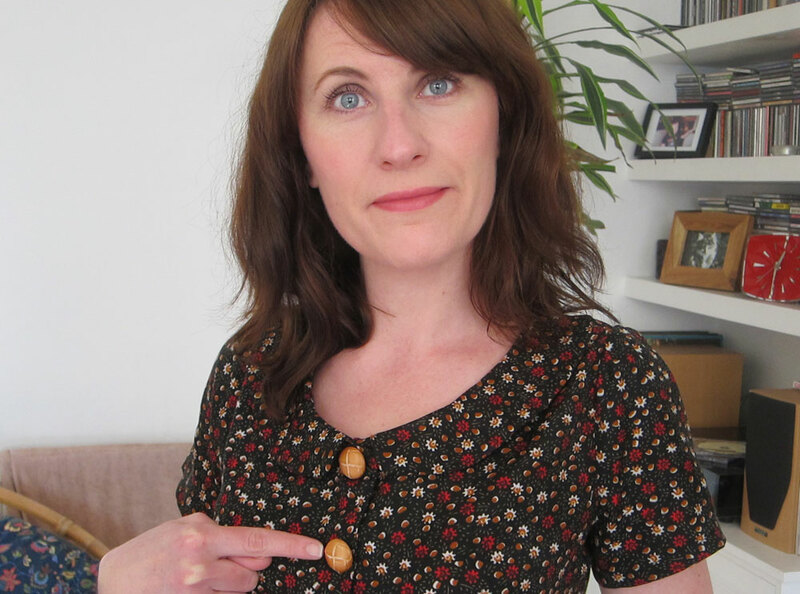 I use tailor’s tacks to mark the centre of the button (where I’ll sew it to the fabric) according to the pattern. I go through both layers of fabric again so I have the markings on both pieces. Then on the piece that will feature the button holes I mark out a couple of centimetres (or however wide the button is) in chalk from this marking towards the sleeve side. I do this on the right side of the fabric. Now this obviously works, otherwise I wouldn’t be telling you about it, but is it strictly the best or the most accurate way to do it? Or do you have a clever tip? 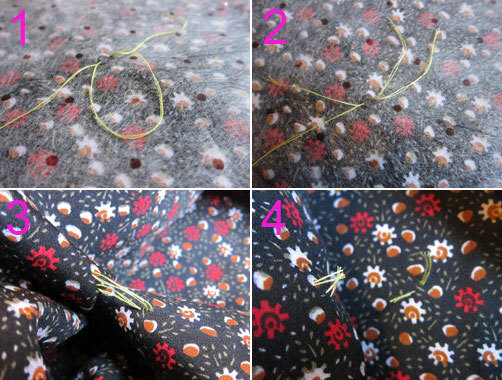 Lauren asked her readers how they notch their fabric recently and there was a lot of interesting feedback – quite a few people actually do cut little triangles outside their seam allowance rather than snip notches into it. I have always snipped into my seam allowance, but a few recent projects where the fabric frayed easily or where I wanted to finish the seams nicely (sans overlocker/serger) highlighted that occasionally it’s not the best solution (those little notches really do interfere with Tasia’s lovely instructions on turning and stitching, especially on a short seam like a shoulder seam!). A good tip I found in Lauren’s comments was to mark the notches in with a pen instead so I might try that. Do you interface your pieces before or after you transfer your markings? I always end up doing it after because I already have my pattern piece pinned to the fashion fabric and it makes sense. But I live in fear that somehow I will lose my markings by adding the interfacing and I HATE living in fear. Do you bother transferring markings such as waist lines? Anything else you always make a point of marking that I haven’t mentioned? What do you use to mark your fabric? I’ve been through chalk (easily broken and not exact enough), pencils (terrible to sharpen and often don’t show up enough on fabric) and carbon paper with a tracing wheel which in theory should transfer pin pricks of colour to your fabric but which in reality never does. At the moment I’m using a chalk wheel which seems to be working ok. Right – no more questions from me – I have a Violet to finish. You can choose to answer all, some or none of these questions accordingly or you can roundly abuse me for asking silly questions – no offence will be taken. Onwards! I’ve wanted to do the Colette Violet for a while. 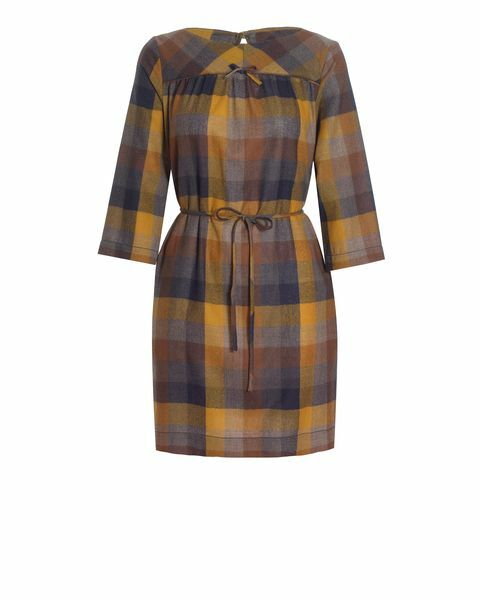 I’ve been thinking it’s more practical for me to have more separates in my wardrobe since (as lovely as dresses are) I’m more likely to reach for them on a bleary-eyed Monday morning in the dark. Plus I wanted a nice blouse or two to take with me on my holibobs that would be light and fresh in the heat but would cover and protect my pale Irish upper arms. 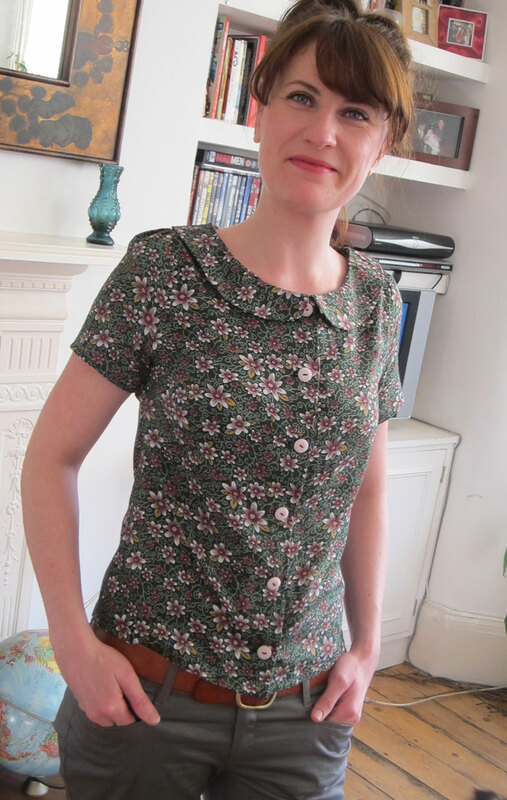 I was inspired by the vintage feel of Lauren’s and Nette’s versions so I chose a very lightweight floral cotton and adapted the pattern so it was a much tighter fit (more details below). 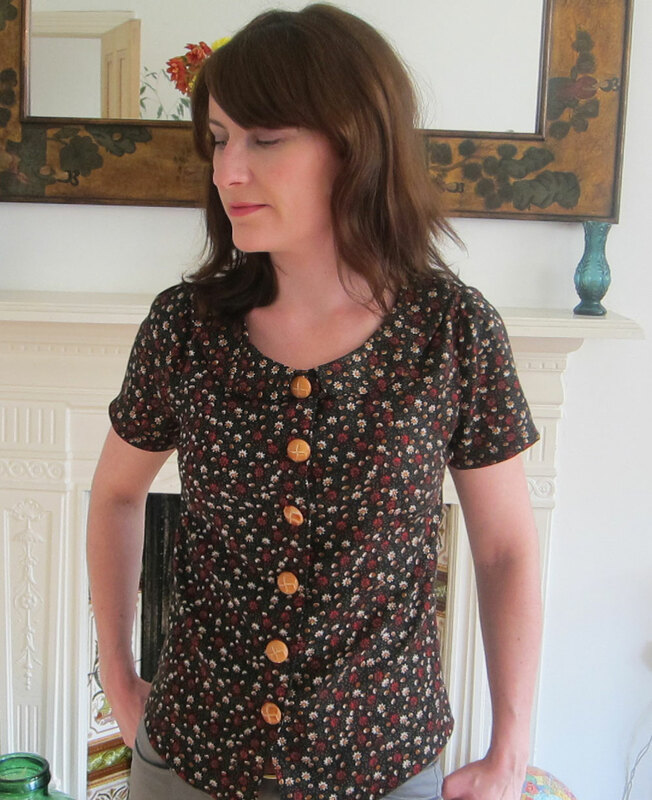 The buttons are vintage – doncha love the pink pop of colour? Lordy that’s a bit of a Prozac gaze isn’t it?! A closer look at the peter pan collar. Fitting issues: Now I knew the Colette Violet is supposed to be a loose-fitting blouse, so I decided to cut out a size 8 from the pattern. But once put together I realised I still wanted a more slender fit. So I hacked off a good bit on either side (see pics below). I also knew that Colette patterns often need a width reduction across the shoulders on me, so I did it right this time and took about an inch off either side at the top of the armhole. 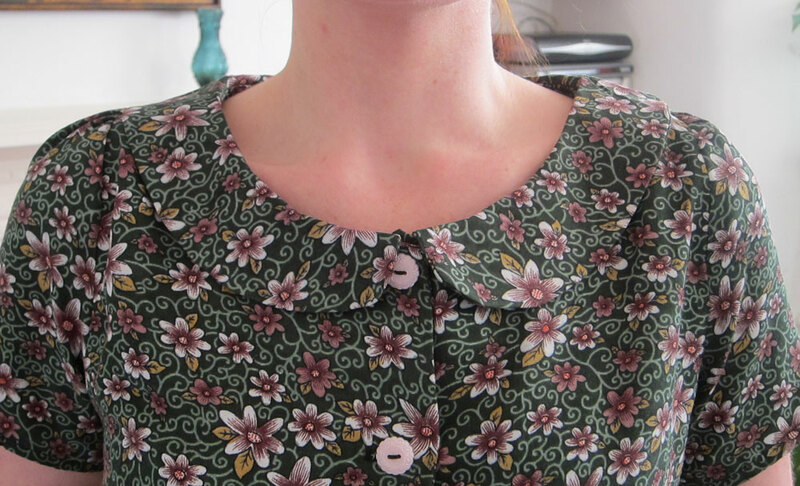 Making issues: I’d previously made a blouse with a peter pan collar and got incredibly confused with the placket and the facing so it ended up being hideous inside (although it was one of my first sewing projects last year). This time, it went like a dream, with Colette patterns’ lovely relaxing yet instructive voice guiding me though each step. I now feel like I can go back to that vintage pattern and try it again! My buttonholes still aren’t perfect. I get this issue on my machine where I can see occasionally it’s not leaving the stitch in the fabric. Not quite sure what’s going on there – may have to consult the manual. Skills learned: Adding a placket. Anything to add? I tried to finish the edges of the facing with self bias binding like Lauren’s fabulous version. I followed Portia’s excellent tutorial for making bias binding – what a breeze! But then tragedy struck – my masking tape is evidently the stickiest EVER and my fabric is soft and thin – the two became inextricably linked and wouldn’t be separated. They are now locked together in their hellish fabric/paper union in the sewing room bin. Ah well. I just turned the edges under a quarter inch instead. Have you made anything multiple times? How do you keep the process fresh so you don’t get bored? A quick midweek post while I finish off my Colette Violet. I just spent a delicious lunchtime gliding around Jaeger looking at their Boutique by Jaeger range. 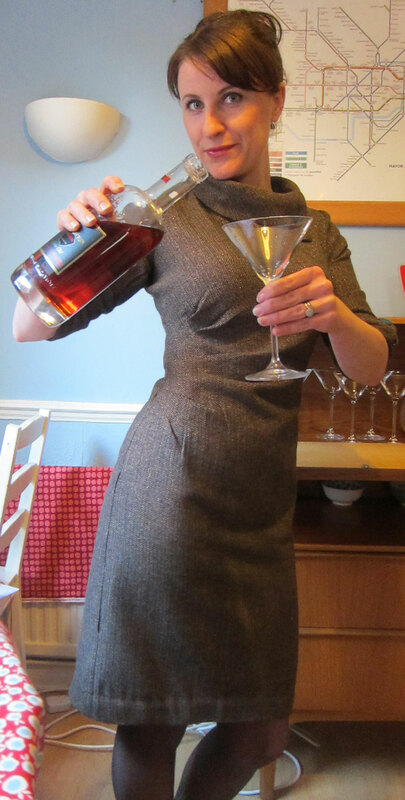 I used to think that Jaeger was where posh people’s mums went for bridal outfits. That may possibly be true of the rest of their range but I never stray far enough from BBJ to check them out. The BBJ range is described on the website as ‘the edgy younger sister of Jaeger. Combining a playful ‘60s spirit with a clean, contemporary aesthetic, expect to find classic pieces with a youthful edge.’ Let me tell you guys, BBJ is right up my strasse. But shame! I can’t afford much (if any of it). A few lovely pieces are in the sale but my January budget won’t stretch to treating myself I’m afraid. So I will content myself by pinning some designs on my Pinterest board and using them for inspiration. Here’s a peek at a few – which is your favourite? Love the tartan? gingham? check and warm colours of this. The shape is very wearable, and dare I say doable? It’s just a simple tunic with yolk at the top, 3/4 sleeves and a few bows isn’t it? 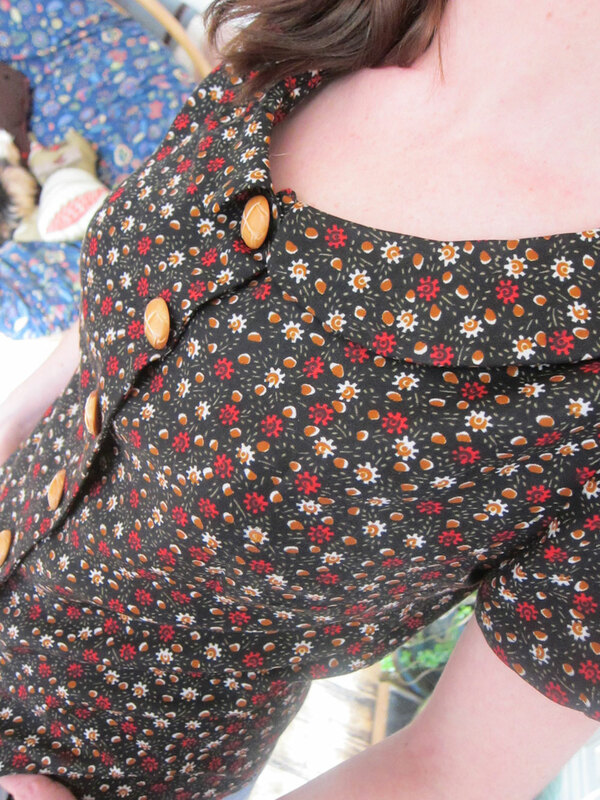 It reminds me of my self-drafted copycat top a bit – perhaps I could extend that into a dress? Isn’t this cute? 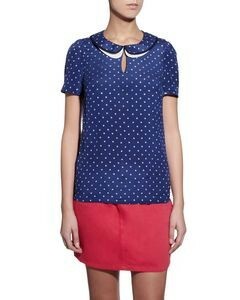 Love the double peter pan collar. Reckon this would be fairly simple to recreate, what do you think? Oh how divine. The little flared cuffs, the bias bound edges, the belt. Sigh. 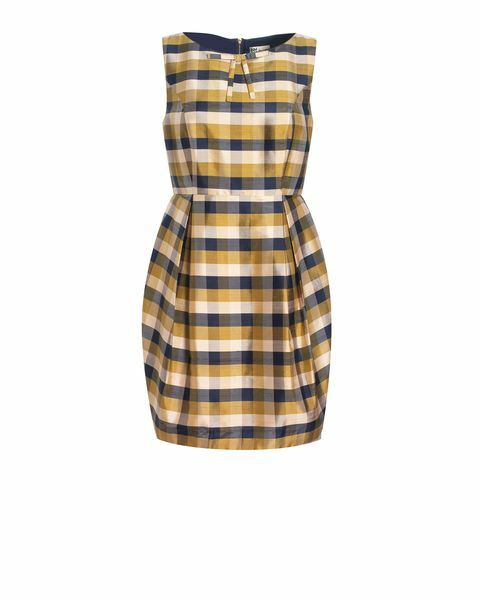 There’s something of the Colette patterns about this dress isn’t there? Gorgeous gingham. I had a good stroke of this instore and can confirm it’s made of the most lovely silk dupioni. The tulip skirt is particularly nice. Can anyone confirm if they are what’s called princess seams running down either side of the bodice? More cute bow detail too. Such a nice detail to include on any item. 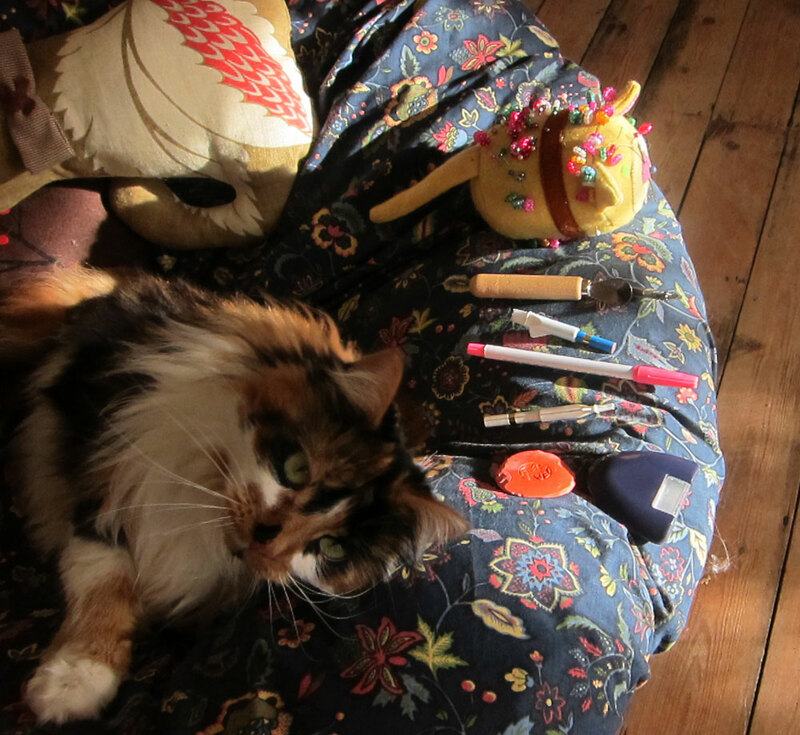 That’s enough dolly-day dreaming for me… but if anyone has any pattern suggestions (or fabric suggestions) let me know! On another note, does anyone else go round shops thinking “I could make that at a push”? It’s started to creep in with me on simpler garments. Still get blown away by some lovely fabrics that I know I could never find myself though. Extolled by local resident Karen and lauded by countless other stitchers the length and breadth of London and beyond, Walthamstow really is a gem when it comes to finding cheap quality fabric. I traipsed across from Ally Pally on New Year’s Eve (feels like a long time ago now) with a £50 budget and a mad gleam in my eye. I blew the budget, but only just, and came home with a heap of fabric and a plan to add some sense to my increasing stash. 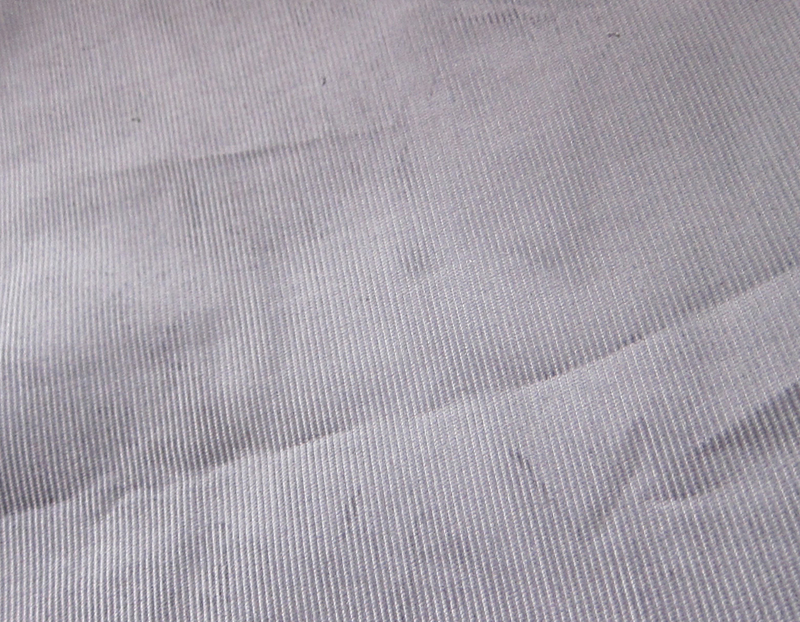 5 metres of silvery-grey corduroy, to be used with my Minoru jacket and for Nette’s Autumn Love dress (gorgeous free pattern! Download now!) It’s darker than the picture suggests, trust me! 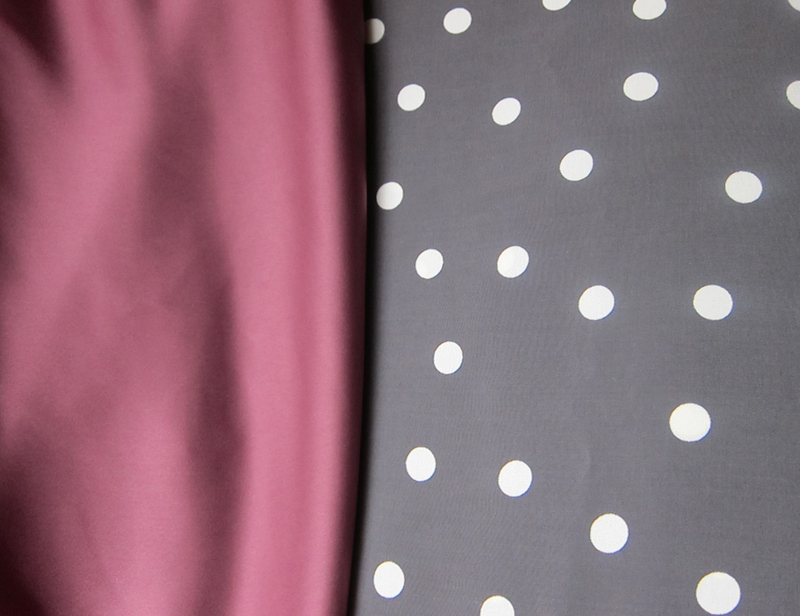 5 metres of this gorgeous grey polka dot polyester and 3 metres of this grape silk charmeuse. Polka dot to be used for Simplicity 7845 and for the bottom half and cuffs of my Hazel dress, grape to be used for the upper part and lining of the Hazel dress. Don’t the colours go beautifully together? 2 metres each of these floral concoctions. To be used for two Violet blouses. 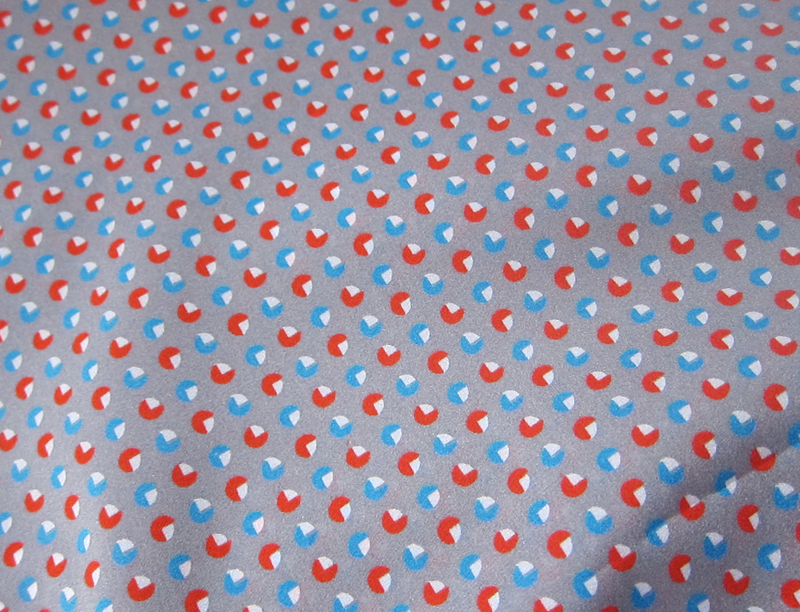 Almost 5 metres of this rather cute vintage style polyester (I think it’s polyester anyway). It was the end of the bolt. Plus 5 metres of calico after Karen’s tip off about asking in Saeed’s for curtain lining. Cheers Karen. That’s 28 metres of fabric for £50! So I mentioned a spreadsheet at the top. Not my idea, readers, but the brainwave of Mela of Pincushion Treats who shared hers on her blog. It’s such a simple but effective idea: detailing pics of what you have in your stash plus measurements so you always know what’s there and whether you have enough for a new project. Genius! Perhaps not ideal if you have a HUGE stash that you couldn’t bear to detail and measure. But great for those of us starting out who want to get a handle on it early. Thanks for the tip Mela! Here’s my spreadsheet – hope you can access it. What about you? Any tips for managing your stash and keeping track of how much fabric you have? Have you made any New Year purchases yet or are you working your way through your existing stockpile?